Tuesday 23 March 1943 My Dearest: Another day passed; twenty-four hours closer to the time when we shall be together. I count them that way and it seems thus that I am getting nearer to my goal. The sky is overcast; storm warnings are flying. Planes are frantically landing against ever increasing winds. Mechanics are tying them down in haste to secure them against the blast. You'd enjoy the sense of things expected; the urgency and yet complete assurance with which preparations are made. 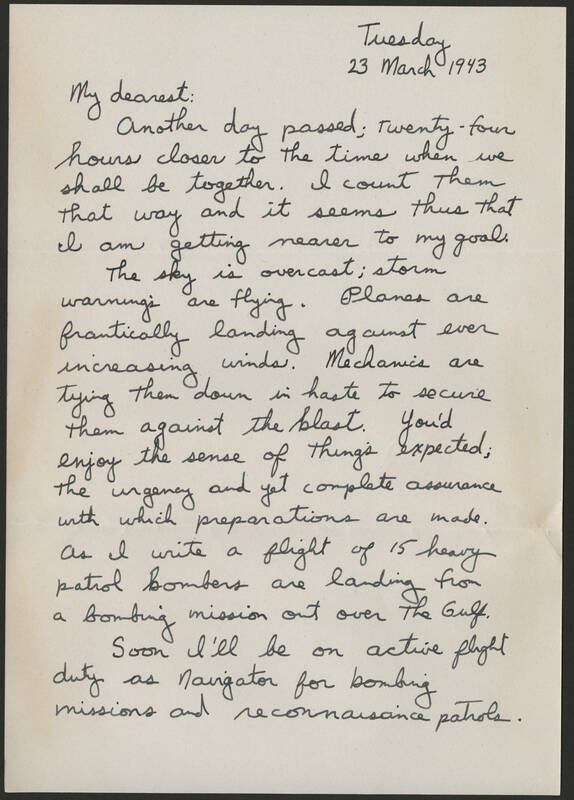 As I write a flight of 15 heavy patrol bombers are landing from a bombing mission out over The Gulf. Soon I'll be on active flight duty as Navigator for bombing missions and reconnaissance patrols.